You can access the live webcast to see what’s being talked about in Budapest. The day started with Ethan Zuckerman and Rebecca MacKinnon, cofounders of Global Voices, talking a bit about the history of GV and the many offshoots that have followed, including Lingua for tanslation, Rising Voices to bring blogging to beyond the Internet elite, and today’s topic, Global Voices Advocacy, which is focused on circumventing censorship. Then Tunisian blogger Sami Ben Gharbia, who is now a Dutch citizen, gave a brief talk about how citizens have used video in Morocco, Egypt, and Tunisia to hold the government accountable for prosecuting corrupt policeman and reporting deaths during protests. He also reiterated the cute cats point about how government censorship precipitated by one video or blog post often leads to over-reaction and censorship of a whole lot more, which then can lead to more citizen involvement and digital activism. His talk was followed by a panel on whether we should create a global anti-censorship network. Alaa Abdel Fatah talks about protecting Noha and others in Egypt who are using their blogs to document corruption and using her posts as evidence in court. He mentioned another blog (El Haqeqa something) that was documenting petrochemicals factory that’s throwing industrial waste in a lake and the company took him to court under accusation of libel. The regime isn’t involved but the tools they are using were created by the government, he says. He also mentioned that there’s a disturbing international trend to uphold internet censorship in courts. For example, he shows a Greenpeace map where genetically modified foods map was blocked by a French court and the “Lyrical Terrorist” in the U.K. Do bloggers need help from outside their country? Are they above the law? Panel moderator Helmi Noman asks. Chris Salzberg talks about Japan, where the internet is open in most respects. But censorship means something very different in Japan than in a country like Egypt. “The Age of Net Regulation is Coming.” Downloading copyrighted material. Filter mobile content for young people. Not as simple as saying leave my internet alone. 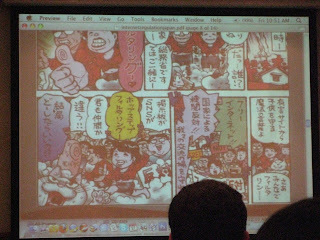 He showed a Japanese cartoon (above) that attributed a child’s bad mood to all the bad content he was getting on the web. There have been quite a few technical problems, but that’s to be expected I guess, and makes me feel a little better about our presentations in Lebanon. More links and reports later.